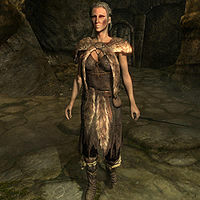 Anska is a Nord mage that is found in the first room of High Gate Ruins and initiates the quest A Scroll For Anska. She believes her family's blood can be traced all the way back to Ysgramor himself, but requires a special scroll contained in the ruins in order to prove it. After the completion of the related quest, she will remain in the ruins indefinitely attempting to decipher the scroll. She wears fur armor and a leveled pair of light boots, which may be up to scaled in quality. She is armed with a leveled dagger that may be up to elven in quality and may also carry a random selection of bandit loot and gold. She casts a leveled set of spells from the Alteration, Destruction, and Restoration schools, including one armor spell, one ward spell, at least one healing spell and at least one of each type of elemental damage spell. Upon greeting her, she will remark, "You look strong." Ask her who she is, and she'll answer, "I'm Anska. Are you here to help?" She will clarify what you'll be helping with, explaining, "I've finally located Vokun's crypt! The scroll I'm looking for just has to be here." Should you ask her, she'll tell you what she needs from you as well: "Maybe you could help find it, I just know it's in here." You can ask more about the scroll she's looking for. She'll tell you, "It's probably meaningless to you, but according to family legend it links our bloodline back to Ysgramor himself." On Vokun, she will say, "Some old priest buried here long ago. I've been searching for his tomb for a few years now." If asked what kind of help she needs, she will admit, "If Vokun is as powerful as I think, I may need a little help um ... dealing ...with him." As for what's in it for you, she will offer, "You can have anything except the scroll of course." If you decline, she'll reply, "Oh alright. Well I'll be here for a bit if you change your mind." On the other hand, if you agree, she will be excited to have your aid: "Great, with the two of us this should be easy." She will follow you from now on. 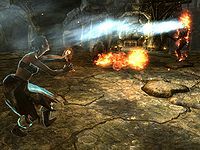 As the two of you slay draugr and explore the ruins, she may muse, "This is fun." or "Sometimes I just like to watch them burn." Farther into the ruins, you will find a room that leads to the catacombs; its stairway is sealed by a trapdoor, surrounded by four levers. Anska will remark, "This looks like some sort of lever puzzle. We'll have to figure out the correct order to flip them." If enough time has passed before you solve the puzzle, she will give you some advice: "Maybe the order has something to do with the Symbols up there." Once you open the trapdoor, proceed into the catacombs. Eventually, you will see a soul gem placed on a weight sensitive plate, on which she will comment, "That gem looks suspicious to me." 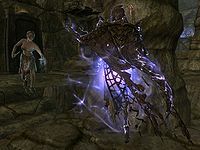 She is correct, as removing the gem will awaken the two draugr nearby. When she enters the hallway decorated with carvings, she will observe, "These wall carvings are ancient, we must be getting close." When you reach Vokun's throne room, the door to his sarcophagus will burst open and he will awaken. Anska will say, "That's Vokun, the guardian of the scroll. It must be just past him." Eliminating him will have her tell you, "Good riddance. Let's move on, the scroll must be in the next room." Go to the next room and she will exclaim, "There it is! On the table." Take the sealed scroll and hand it to a grateful Anska, who will say, "I cannot thank you enough for all of the help." Hand the scroll to her, and she will reward you with the Conjure Flaming Familiar spell tome: "And here's a little something for helping me out." If you ask her what the scroll says, she will respond, "Let me look. This is a very exciting moment for me." However, it turns out she can't tell you more: "Hmm, it's encrypted. It'll take a while to figure this out." After you've given the scroll and completed the quest, Anska will express her gratitude to you: "Thank you again for all the help." It is possible to retrieve the scroll without her. To do so, avoid talking to her at the start of the ruins, and once Vokun is dead, she will run up to you as if you've agreed to help her. The quest will then proceed normally. She has some unused dialogue: "Looking for work?" and "An alchemy lab, it could be in here. It's worth a look." Game data also indicates an option to deny her the scroll, but the wrong conditions are set, so they cannot be chosen in normal gameplay. When she thanks you for your help in retrieving the scroll, you could have refused to hand it over, to which she would have told you, "I'm sorry, but I can't let that happen." You could have also said that you've found this scroll, and she would have been amazed: "Could it really be? Wow this is what I've been looking for. Can I have it? It's worthless to you, but I can pay." If you tell her she can take it, she would have replied, "Thank you so much, this scroll means a lot to my family. Take this for your trouble. ", but if you choose to hang onto it, she would have been angry: "I'm sorry, I've come too far to lose it now." Even after High Gate Ruins resets, Anska will not leave the dungeon and will stay inside the first chamber. This page was last modified on 17 April 2019, at 01:40.